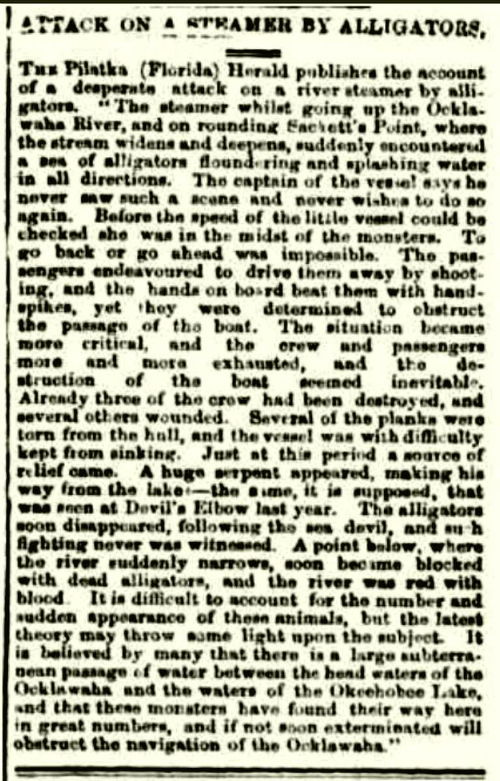 By Jon Wyatt - I was trawling the Trove Digitalised Newspapers and came upon this astonishing story from Florida. The yarn was widely pubished in Australian newspapers and elsewhere in 1871. The Ocklawaka River, the scene of the battles, is a narrow waterway that meanders northward for 74 miles (115 kms) before emptying into the St Johns River near the city of Pilatka. Small paddle steamers used to operate on the waterway until the 1920's. 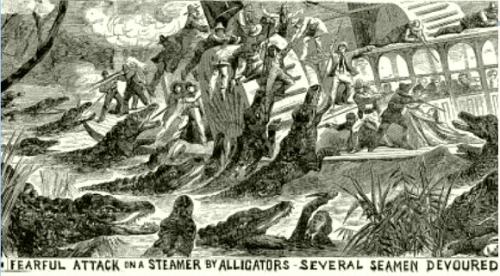 The report of alligators attacking a steamboat is possible but the “huge serpent” part seems a bit far-fetched to me. The story does not identify the steamer, the captain or any of the passengers and crew. Is it a tall tale or true? I'll leave it up to you.